Brands are often pushing to reach multiple goals at any given time. From improving customer loyalty to lead nurturing, brand awareness, and engagement. The marketing, sales, and service teams have a lot on their plate. However, no goal is more important for B2B companies than lead generation. To improve B2B lead generation, your organization needs a strategy for producing and promoting content. Just sharing relevant content isn’t enough. To do this, you need to identify who your audience is so content is on point with the right messaging, and promoted in the right places. Armed with this knowledge, you can promote content to reach a targeted audience and build a leak-proof funnel that nets new leads while you sleep. The modern B2B buyer journey has become far more complex. MarketingSherpa found companies using buyer personas increased revenue by 171%. So, how do you build targeted personas for your lead generation campaigns? Start with the data, and build on top of it. In particular, add in the greatest pain points of your audience. Include very specific triggers that motivate them as well as fears and challenges. There’s a tremendous difference in the depth of information. Knowing this information is absolutely critical to building a targeted lead generation campaign. In fact, 71% of companies who exceed revenue and lead gen goals have clearly documented personas. An important thing to keep in mind is this process will take time. Data shows persona development can take anywhere from a few weeks, to two or three months. Marketing teams are now leaning heavily on sales teams to produce content that helps them tell a story, communicate value, and ultimately move the lead down the funnel from prospect to paying customer. SiriusDecisions found B2B organizations with tightly aligned sales and marketing operations achieved 27% faster profit growth over a three year period. Getting sales and marketing working together is a key part of improving lead generation as well as creating effective content for every stage of the sales funnel. Without unification, its difficult for both teams to drive in the same direction. Both sides need to understand that moving through one stage advances the other. Further, you’ll often find a difference between how marketing and sales team qualify leads. Sales often demand higher quality leads from marketing, while marketing says the leads are fine and sales just needs to improve how they close the lead. When sales and marketing work more closely, not only can you develop more targeted buyer personas, but the content can be more appropriately mapped to the buyer’s journey. Once your teams are on the same page you can start digging into where your leads are coming from, and how to best engage (and nurture) those leads to get them “sales-ready”. Before you can develop any kind of inbound strategy you need to know where your leads are consuming information online. Otherwise, you’re just guessing which marketing channels you should be using to distribute content. On average, B2B organizations use six different channels for promoting and distributing interactive content online. Email is clearly the most popular followed by a number of social channels. But, this is just the tip of distribution iceberg. There are literally hundreds of different channels you could be tapping for traffic, including SEO, guest posting, influencer marketing, co-marketing, and a variety of other earned, owned and paid media channels. Your audience research should help you prioritize which channels to focus on. Basically, this allows you to identify the top channel targets based on key constraints like time, budget, and control. You can find out more about this process here. Ineffective content marketing is not a supply problem; it’s a strategy problem. One of the most common mistakes marketers make is creating content for the sake of creating content, or targeting keywords for the sole purpose of increasing organic traffic. Visibility is great, but if your content serves no purpose other than putting your brand in front of as many people as possible, it’s probably not contributing to the sales funnel or conversion process. Every piece of content you create should be developed with a specific purpose in mind. i.e. it should be created to provide value and support the buyer at a specific stage of the sales funnel, from demand generation (top of the funnel) to nurturing and closing the sale (middle and bottom of the funnel). From this you can see certain types of content will be more effective during the awareness stage (top of funnel), while others are more effective during the purchase stage (bottom of the funnel). 1. How will customers at this stage find me? 2. What kind of information do customers at this stage need? 3. How will I know if customers have moved on to the next stage? These questions will keep you on track, and ensure their is a purpose behind every piece of content you are creating. We’re already at a point where more than 3.5 million posts are being published every day, up from around 2 million in 2015. As a result, marketers now need a content vehicle that will help them break through the noise and better engage readers. One of the biggest challenges facing marketers in B2B is creating engaging content. Truth is: the quantity of content being published today creates a lot of noise, and your audience is constantly seeing the same blog posts, ebooks, and slide decks paraphrased and regurgitated day in and day out. Interactive content lets you tackle this problem head on. By creating a two-way dialogue with your readers, instead of a one-way monologue. Interactive content requires the participants’ active engagement — more than simply reading or watching. In return, readers receive a real-time, personalized content experience they actually care about. Each content type provides a medium to cut through the vast majority of filler content floating around the web. 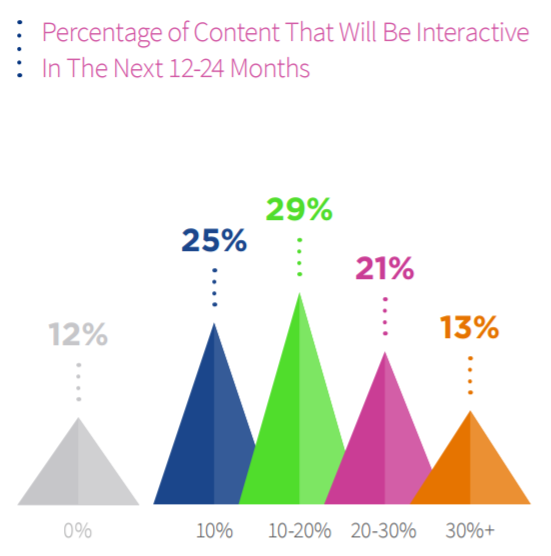 Not only do 88% of marketers say interactive content has helped set their brand apart from competition, it’s also effective at increasing engagement and leads. According to Kapost, interactive content generates twice as many conversions as passive content. In other words, all this content production does not mean you’re winning at content marketing and lead generation. Most B2B marketers are doing the first part. Very few are doing the second part. At least, effectively. Refer to the channel matrix you built in the previous section to identify your distribution channels. You want to be spending at least half your time promoting content assets on targeted channels. While measuring the number and quality of leads is critical, this dashboard is all about focusing on the variables that are in your direct control. This helps keep people executing on the strategy and things they have direct control over, rather than getting too wrapped up in the end result. There are a number of paid strategies you can employ to boost the visibility of your content. Google PPC – Rather than banking on people finding your content, use PPC ads to promote it. Google PPC works so well because you can target intent. Unless you have a massive PPC budget, make sure you focus ad spend on keywords with commercial intent. SnapApp might decide to bid on keywords such as “interactive content software”, instead of “how to make interactive content”. One has buying intent, the other informational. Google PPC provides a great vehicle to get immediate SERP visibility for highly competitive keywords you might otherwise spend months or years trying to rank for organically. For B2B companies with a solid conversion strategy, these types of keywords typically drive a lot of qualified leads into the funnel. 90% or more of the people hitting your website are going to leave without taking the desired action. Enter retargeting. Retargeting – While retargeting ads are commonly used in eCommerce and the B2C space, they can be just as effective for B2B prospects. At a basic level, retargeting ads are created to show specific content or ads to prospective customers who took a certain action at some point in your sales funnel. Like the above image, after a user takes a pre-defined action your ads will begin showing up on other external sites. Content is dynamically displayed in an attempt to move users to the next step in the funnel. Retargeting audiences and content should be built with these 3 objectives in mind. What is most important to you? Social Media Ads – You can promote your content, at any stage of the funnel, to prospective leads based on job title, region, interests, behaviors, relationships and a number of other laser focused targeting criteria, across many different social networks: facebook, LinkedIn, Twitter, YouTube etc. Similar to Google PPC retargeting, you can use social ads to acquire, activate and monetize your customer base. Here is a basic example of Digital Marketer using facebook custom audiences to activate the non-converters. You can use social media ads to dynamically retarget and move people step by step through your funnel. Events and Conferences – If your organization is active in the conference circuit this is a terrific time to employ interactive content. Touch screen displays are one example of an interactive medium you can use to get attendees more hands-on, and engaging with your brand or product. Whenever SnapApp attends a conference or event we have interactive content types like calculators and assessments on premise to allow attendees to experience the product. Not only are we able to create a more personalized, engaging experience, but each content type also allows us to capture lead information at the point of engagement. No more awkwardly asking for emails and phone numbers after the fact. The whole attendee experience is seamless. While paid promotional strategies are one vehicle to quickly amplify your content to an extremely targeted audience, there is also a long list of unpaid promotional tactics you can use to get fresh eyeballs on your content. Co-marketing – Any time you can team up with other brands and influencers to promote your content you can greatly expand your reach to new audiences. Guest posts – Guest posting has a number of benefits. 1. Leverage high-authority sites to rank for competitive keywords. 2. Drive targeted referral traffic. 3. Build authority by association. That post has been ranking #1 and driving a continuous stream of leads to Steve’s business for over 5 years! Bottom line: it doesn’t always make sense to publish on your site, especially when you need to builf site authority. No matter how good you are at creating and promoting your content, if there is no strategy to capture leads, it’ll all be for nothing. Traditionally, marketers have done this using lead magnet forms – providing content upgrades, demos, and trials. While this is effective, it does require an additional step before or after a prospect engages with your content. Every additional step is a little more friction in getting the audience to take action. This is where interactive content can help make the lead generation process a more seamless experience for the end user. At the bottom of the funnel, you’ll want custom content to help the user during the decision-making process, like configurators and wizards. You can check out this guide to see how other companies are using interactive content to capture leads. When it comes to tracking performance, take the approach Noah Kagan took when building the marketing strategy for Mint.com. Over time you can cut out the channels that underperform, while putting more time and resources into those channels consistently delivering qualified leads. Noah goes into great detail on how to measure the target for your marketing channels, including conversion percentages in this post. Once you have a better understand of who your audience is and where to find them online, you can position interactive content throughout the sales funnel to generate more qualified leads, and close them faster.